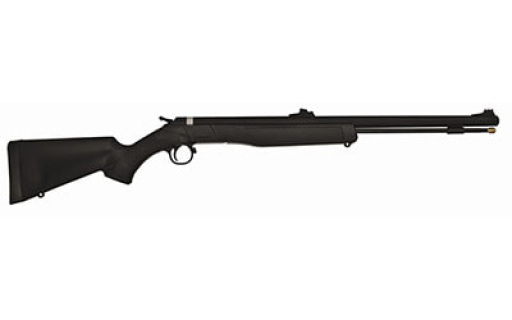 The ACCURA MR (Mountain Rifle) with its lightweight design (6.35 pounds) and shorter, more compact 25 inch barrel, is designed to be easier to carry and more maneuverable than our standard muzzleloaders with a fit and ease of target acquisition that is reminiscent of a custom-made rifle. And the ACCURA MR sports all the features that have made CVA ACCURA V2 famous a custom quality Bergara Barrel, Quick Release Breech Plug (QRBP), Trigger Guard Actuated Breeching Action, Neutral Center of Gravity Trigger, matching Quake Claw Sling, premium SoftTouch stock with rubber grip panels, DuraSight DEAD-ON one-piece scope mount and PalmSaver ramrod. 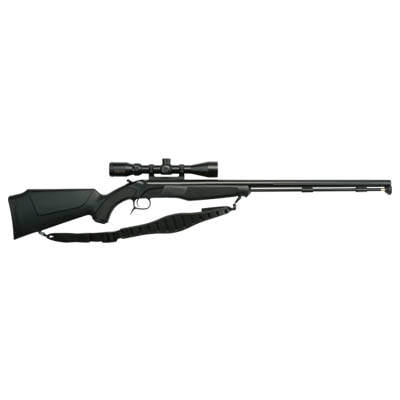 The ACCURA MR comes standard with our Nitride treated stainless steel Bergara barrel and a solid black composite stock. 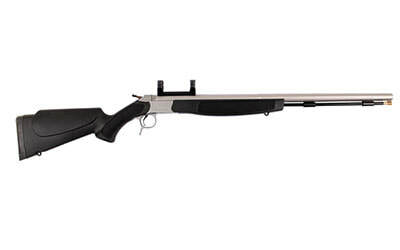 The ACCURA MR (Mountain Rifle) with its lightweight design (6.35 pounds) and shorter, more compact 25" barrel, is designed to be easier to carry and more maneuverable than our standard muzzleloaders – with a fit and ease of target acquisition that is reminiscent of a custom-made rifle. 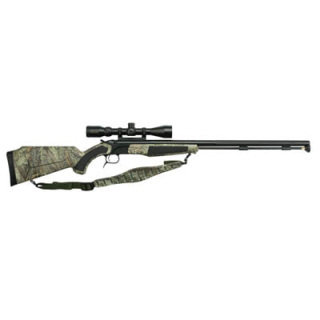 And the ACCURA MR sports all the features that have made CVA ACCURA V2 famous a custom quality Bergara Barrel, Quick Release Breech Plug (QRBP), Trigger Guard Actuated Breeching Action, Neutral Center of Gravity Trigger, matching Quake Claw Sling, premium SoftTouch stock with rubber grip panels, DuraSight DEAD-ON one-piece scope mount and PalmSaver Ramrod. The ACCURA MR comes standard with our Nitride treated stainless steel Bergara barrel and a Realtree Max-1 XT composite stock. Our new ACCURA PR (Plains Rifle) with its 28" Nitride-treated 416 grade stainless steel barrel, provides a high level of long-range performance capability without sacrificing balance and maneuverability. Like all ACCURA series rifles, the ACCURA PR features genuine Bergara barrels, recognized as being among the most accurate production rifle barrels in the world. The Nitride treatment hardens the outer layers of the barrel steel and turns it a rich black color, making these barrels impervious to corrosion inside and out. Additional standard equipment includes CVA patent pending Quick Release Breech Plug (QRBP), Realtree Max-1 HD Stocks, a Quake Claw sling, DuraSight DEAD-ON one-piece scope mount, a soft-touch stock with rubber grip panels, PalmSaver solid aluminum ramrod, and a CrushZone recoil pad. Modeled after CVA's top-of-the-line ACCURA V2, OPTIMA V2 rifles feature the same trigger-guard actuated breeching lever, internal parts, and trigger. All OPTIMA V2 barrels are constructed of 416 grade stainless steel, and are offered in either the standard stainless or with our state-of-the-art Nitride rust-proofing process. Add in CVA Quick-Release Breech Plug (which is finger removable), 100% ambidextrous stock, and a CrushZone recoil pad, and you've got a gun with more quality features than any other muzzleloading rifle in its price range. Equipped with a 26" barrel, the OPTIMA V2 is easy to maneuver in the treestand and comfortable to carry in the mountains. And it comes standard with DuraSight fiber optic sights, and CVA solid aluminum PalmSaver ramrod. Modeled after CVA's top-of-the-line ACCURA V2, OPTIMA V2 rifles feature the same trigger-guard actuated breeching lever, internal parts, and trigger. All OPTIMA V2 barrels are constructed of 416 grade stainless steel, and are offered in either the standard stainless or with our state-of-the-art Nitride rust-proofing process. 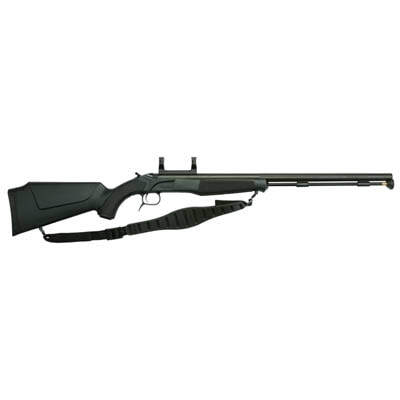 Add in CVA's Quick-Release Breech Plug (which is finger removable), 100% ambidextrous stock, and a CrushZone recoil pad, and you've got a gun with more quality features than any other muzzleloading rifle in its price range. Equipped with a 26" barrel, the OPTIMA V2 is easy to maneuver in the treestand and comfortable to carry in the mountains. And it comes standard with a DuraSight DEAD-ON one-piece scope mount, and CVA's solid aluminum PalmSaver ramrod. Modeled after CVA's top-of-the-line ACCURA V2, OPTIMA V2 rifles feature the same trigger-guard actuated breeching lever, internal parts, and trigger. All OPTIMA V2 barrels are constructed of 416 grade stainless steel, and are offered in either the standard stainless or with our state-of-the-art Nitride rust-proofing process. Add in CVA's Quick-Release Breech Plug (which is finger removable), 100% ambidextrous stock, and a CrushZone recoil pad, and you've got a gun with more quality features than any other muzzleloading rifle in its price range. Equipped with a 30" barrel, the OPTIMA V2 is easy to maneuver in the treestand and comfortable to carry in the mountains. And it comes standard with a DuraSight DEAD-ON one-piece scope mount, and CVA's solid aluminum PalmSaver ramrod. Modeled after CVA's top-of-the-line ACCURA V2, OPTIMA V2 rifles feature the same trigger-guard actuated breeching lever, internal parts, and trigger. All OPTIMA V2 barrels are constructed of 416 grade stainless steel, and are offered in either the standard stainless or with our state-of-the-art Nitride rust-proofing process. 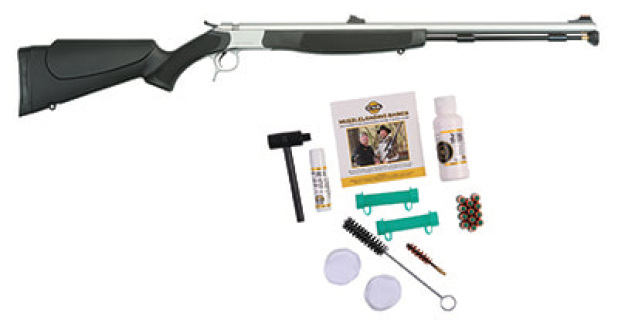 Add in CVA's Quick-Release Breech Plug (which is finger removable), 100% ambidextrous stock, and a CrushZone recoil pad, and you've got a gun with more quality features than any other muzzleloading rifle in its price range. Equipped with a 28" barrel, the OPTIMA V2 is easy to maneuver in the treestand and comfortable to carry in the mountains. And it comes standard with a DuraSight DEAD-ON one-piece scope mount, and CVA's solid aluminum PalmSaver ramrod. 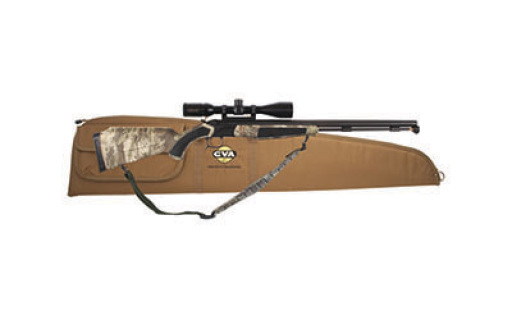 The WOLF is our most affordable break-action muzzleloader, but it’s still packed with features that only CVA can offer at its price. The 100% ambidextrous stocks are a stealth black color. The WOLF also features CVA QRBP (Quick-Release Breech Plug) – the only truly tool-free removal breech plug on the market today. Even after 20 or more shots, the QRBP comes out with just a twist of the fingers try that with any other speed breech system. Plus, the break-action breech opens easily with just a touch of the breeching button, which is located in the front of the trigger guard. The WOLF’s compact and quick-pointing barrel is made of either blued carbon steel or 416 grade stainless steel and is set up with DuraSight fiber optic sights. CVA's solid aluminum PalmSaver ramrod is also standard equipment on all WOLF models. The WOLF is our most affordable break-action muzzleloader, but it’s still packed with features that only CVA can offer at its price and this year it's available with a Nitride treated stainless steel barrel. The 100% ambidextrous stocks are available in either black or Realtree Xtra Green. The WOLF also features CVA QRBP (Quick-Release Breech Plug) – the only truly tool-free removal breech plug on the market today. Even after 20 or more shots, the QRBP comes out with just a twist of the fingers try that with any other speed breech system. Plus, the break-action breech opens easily with just a touch of the breeching button, which is located in the front of the trigger guard. The WOLF compact and quick-pointing barrel is made of either blued carbon steel or 416 grade stainless steel and is set up with a DuraSight DEAD-ON one-piece scope mount or DuraSight fiber optic sights. 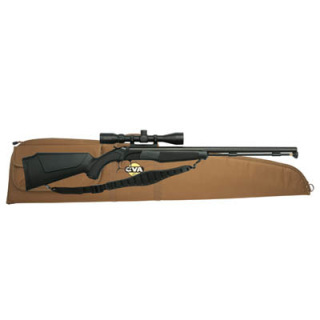 CVA's solid aluminum PalmSaver ramrod is also standard equipment on all WOLF models. 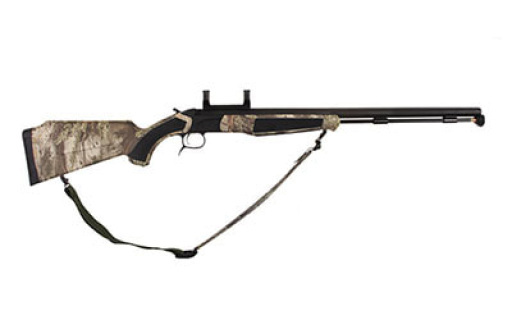 The WOLF is our most affordable break-action muzzleloader, but it's still packed with features that only CVA can offer at its price and this year it's available with a Nitride treated stainless steel barrel. The 100% ambidextrous stock are Realtree Xtra Green. The WOLF also features CVA's QRBP (Quick-Release Breech Plug) - the only truly tool-free removal breech plug on the market today. Even after 20 or more shots, the QRBP comes out with just a twist of the fingers - try that with any other "speed breech" system. Plus, the break-action breech opens easily with just a touch of the breeching button, which is located in the front of the trigger guard. The WOLF's compact and quick-pointing barrel is made of Nitrided 416 stainless steel and is set up with a DuraSight DEAD-ON one-piece scope mount. 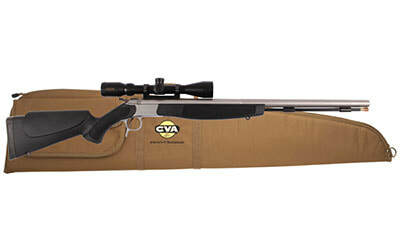 CVA's solid aluminum PalmSaver ramrod is also standard equipment on all WOLF models.